Sawgrass Of Naples Homes: Sawgrass of Naples is a small community perfectly located in North Naples less than four miles from the Gulf of Mexico and Delnor-Wiggins Pass State Park. This 4 bedroom, 3 bath open-concept pool home is within walking distance to several restaurants and has a walking path leading to a small park and children’s playground. The home is designed to function well with a guest suite at one end and the master suite at the other. All windows have custom plantation shutters. There are 5 entrances to the large lanai/pool which makes for good flow when hosting parties. Over sized 2-car garage provides extra room for storage or projects. Included is a 12-month home warranty that starts the day of closing. New roof in 2019. 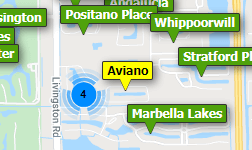 Great school district and close to North Naples Central Hospital and Arthrex. Need professional assistance selling your property at Sawgrass Of Naples Naples? Find out how an Area Specialist can help to generate more property exposure in order to get the most money for your investment in the least amount of time.